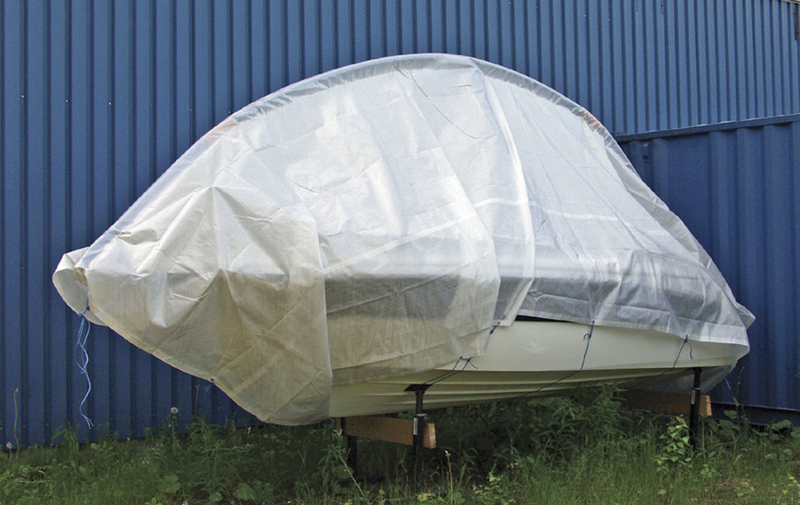 The lightweight EasyTec boat cover frame can be fitted quickly and is priced significantly lower than traditional covers. 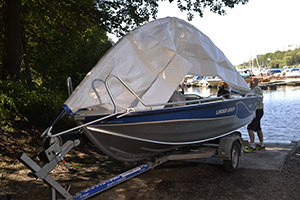 Because the boat cover frame is made of lightweight, two-metre long, custom-manufactured piping, it is easily assembled to the desired length, it is also easy to carry and move around. 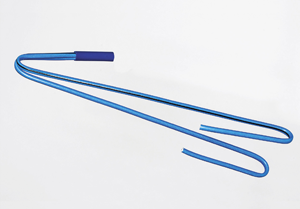 EasyTec is supplied in two large bags with a carrying handle. 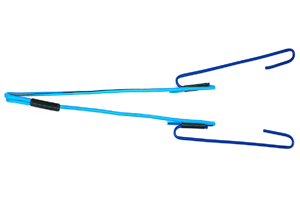 EasyTec’s design is based on S-hooks being attached to the bow and stern of the boat. 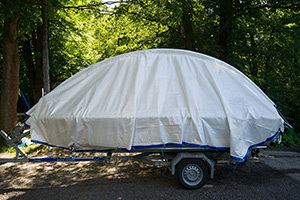 The two-metre-long pipes are then connected together to make a long pipe, which is then pushed into a sewn channel on a tarp. 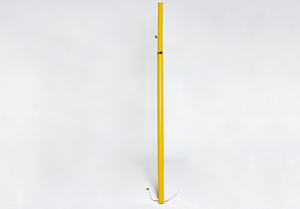 EasyTec includes up to 6 x 2 m long, custom-made support pipes, the recommended number of vertical supports and two S-hooks to attach the frame to the stern and to the bow of the boat. 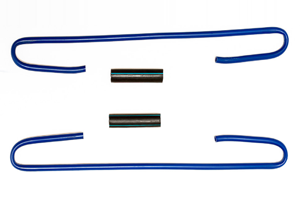 An S-splice (extension kit to extend the S-hooks, if necessary) is also included. 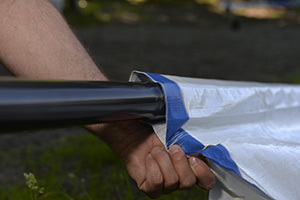 A heavy, contoured 240-gram tarp with a sewn channel is also included. A rope and knife are always included. Everything you need to set it up is included. 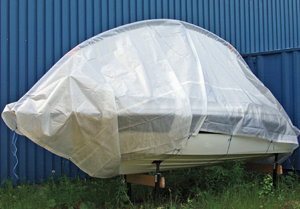 The boat cover frame is suitable for all motor boats and sailboats from 4-9 m.
A complete ready-for-assembly boat cover frame including tarp. With prices from SEK 2,950. 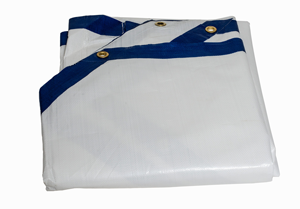 240 gram custom-made and sewn white tarp is included with the cover frame. A short S-hook, which is normally attached to the bow of the boat. The S-hooks are adjustable. A long S-hook, which is normally attached to the stern of the boat. The S-hooks are adjustable. 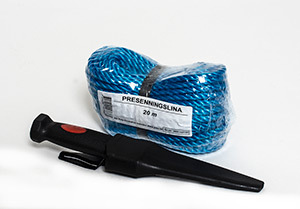 An S-splice (extension kit for the S-hooks) is included, which can be used if necessary. Support pipes, 2 m long, with sleeve. Made of special plastic that is resistant to cold temperatures, (3-6 pieces are included in each package). Supports, 2 m long, with bevelled top and stainless straps that are used to affix to the support pipes and underneath the boat. Comes with 2-6 supports, depending on the size of the package. 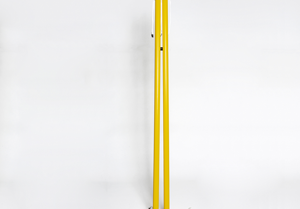 Telescopic support, 2-3,3 m long. Two pieces included in the package 10 and can also be purchased separately. Tarp rope and a knife are always included. EasyTec is packaged in two practical bags. The handles have five different colours. One colour for each package size. 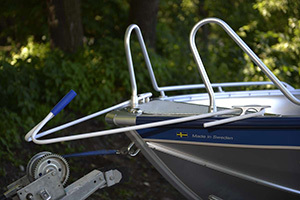 Put the short S-hook in the front/bow, preferably hook on cleats or pulpit and the long S-hook on back/stern of the boat. 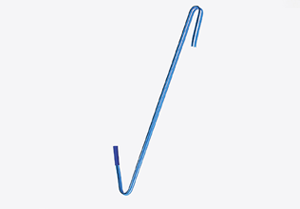 The S-hooks can also be extended by using the supplied S-splice. 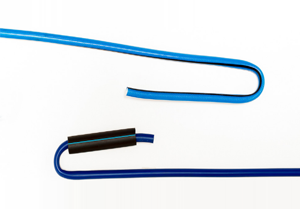 Put the blue pipes together in full length and try out the arc/bow from S-hook to S-hook so the height is at least 1,5m (60 inches) over deck or 0,5m (20 inches) over roof/high objects. Unfold the tarpaulin and push in the pipes in the sleeve in the middle. 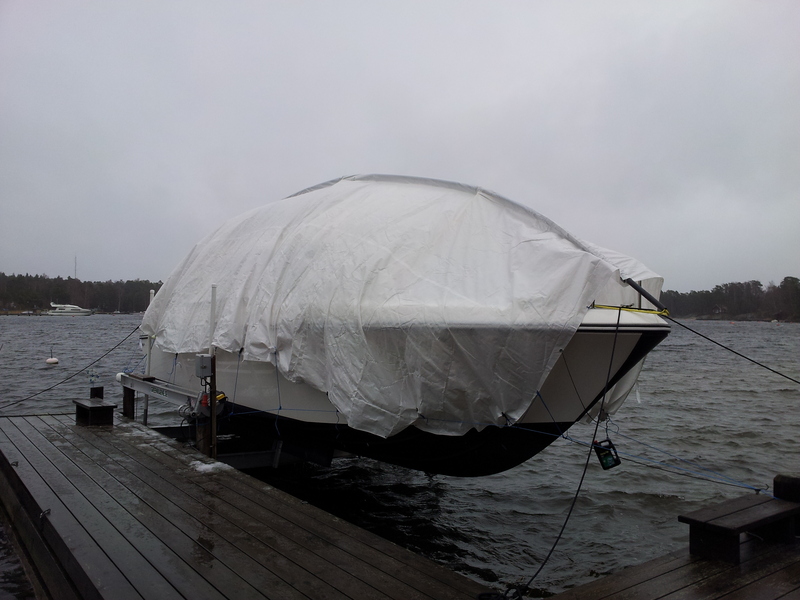 Lift pipes and tarpaulin up on the deck and apply the pipe ends on S-hooks. A bow/arc is now along the boat and standing without support. 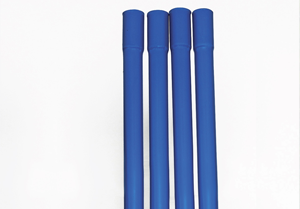 Apply the support-bars where there are openings in the tarpaulin (phase out end towards the blue pipes, use straps with two turns around blue pipe). 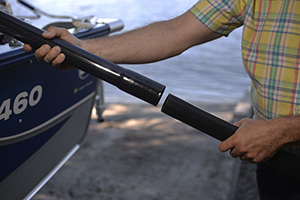 Use the other strap to fix the bottom of the support-bar to something on boat so it is steady. Common is to set two support-bars together in A-formation. 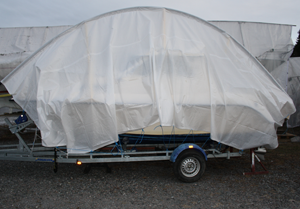 Finish fastening the eyelets of the tarpaulin with the supplied ropes. 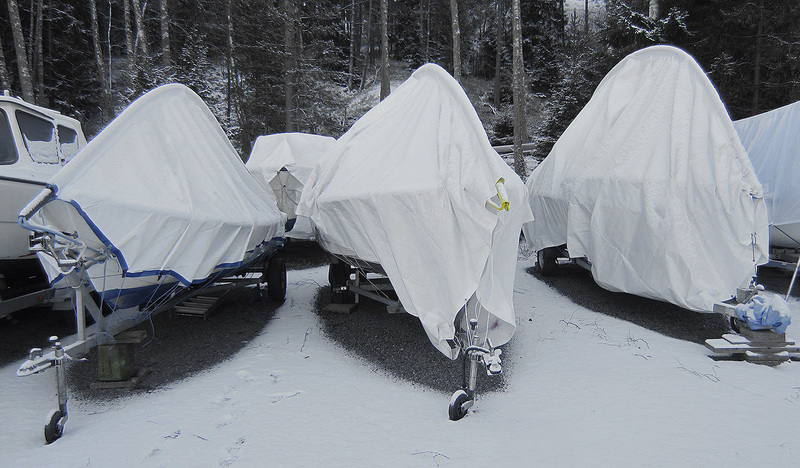 All parts of the boat cover frame are available for purchase as spare parts. 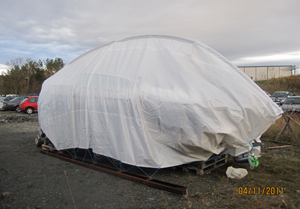 It is therefore possible to add extra supports and to purchase a new tarp. What size should I choose! 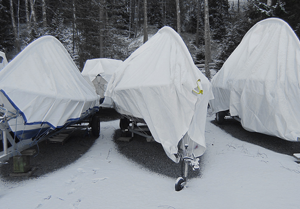 EasyTec is a very versatile boat cover frame, which is normally suitable for all motor boats and sailboats from 4-9 m. Boats, however, can be very different and a large outboard motor can for example impact on the size of the most appropriate package for your boat. 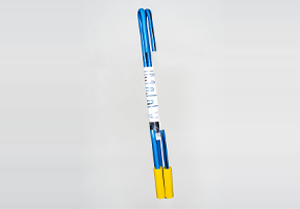 EasyTec is available in five sizes with package numbers from 6 to 10. The package number is based on the length of the tarp. 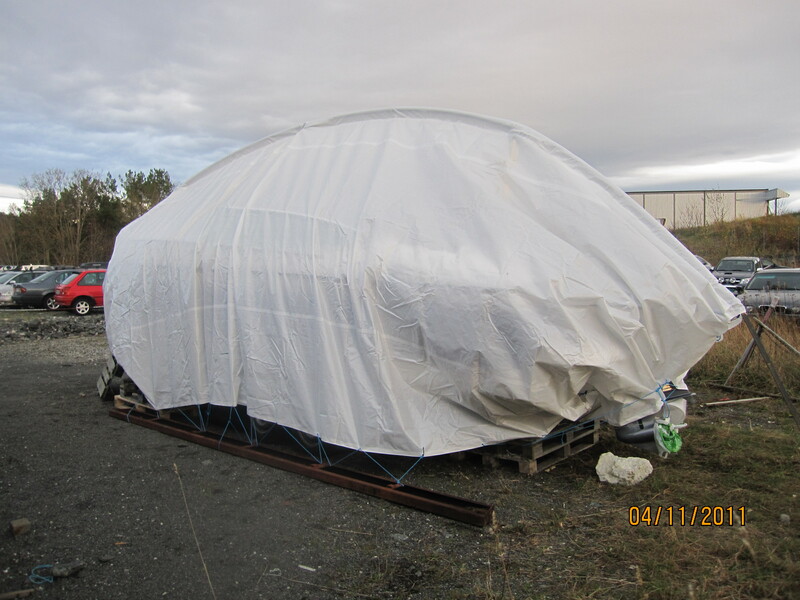 Package 7 has a tarp which is 7 m long and 5 m wide. 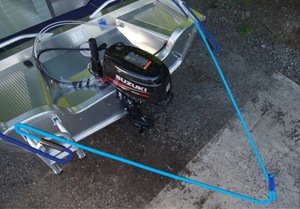 Package 7 is suitable for a boat between 5-6 m.
Choosing the appropriate package for a boat without an outboard motor should be based on the boat’s length. 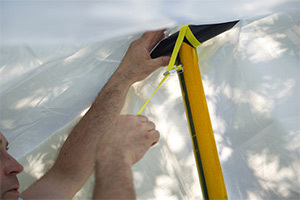 Add approximately one metre for the part of the tarp that is taken up by the arch shape of the frame. 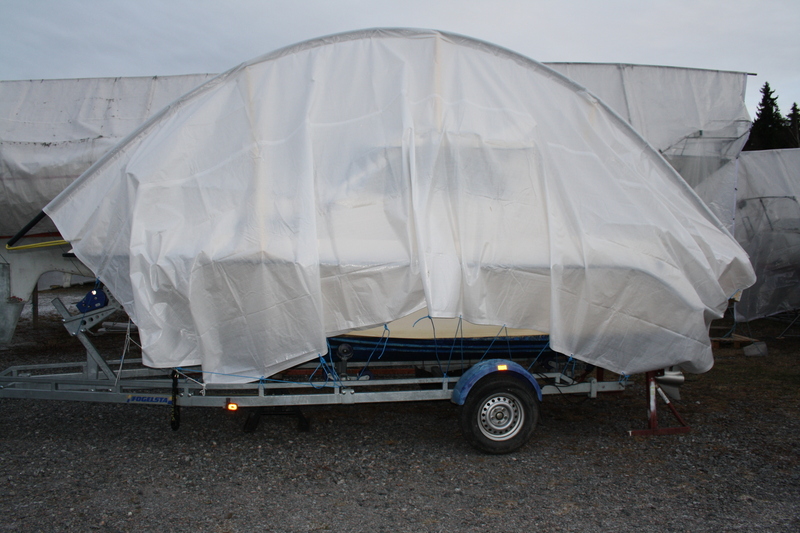 We add 1 metre for a 5.75 m long boat, which means 6.75 m. So package 7 is the most appropriate package. 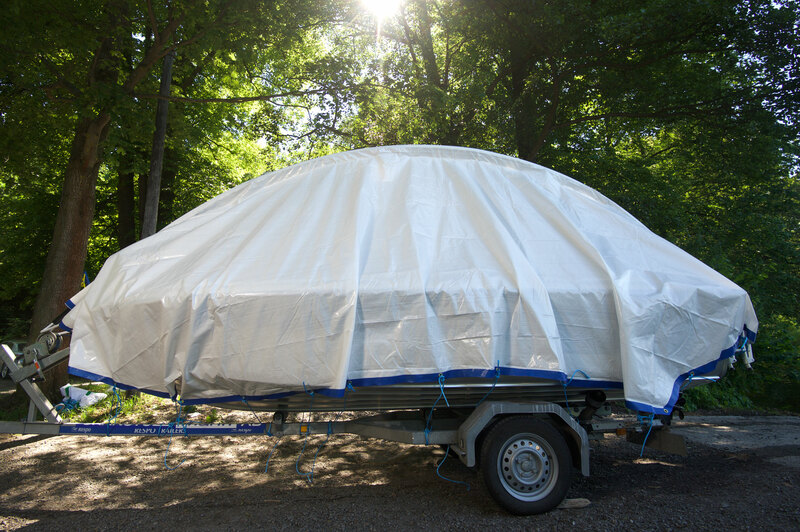 But if your boat has an outboard motor, it is normal to cover the outboard motor as well, this will take up at least another half a metre of tarp length. 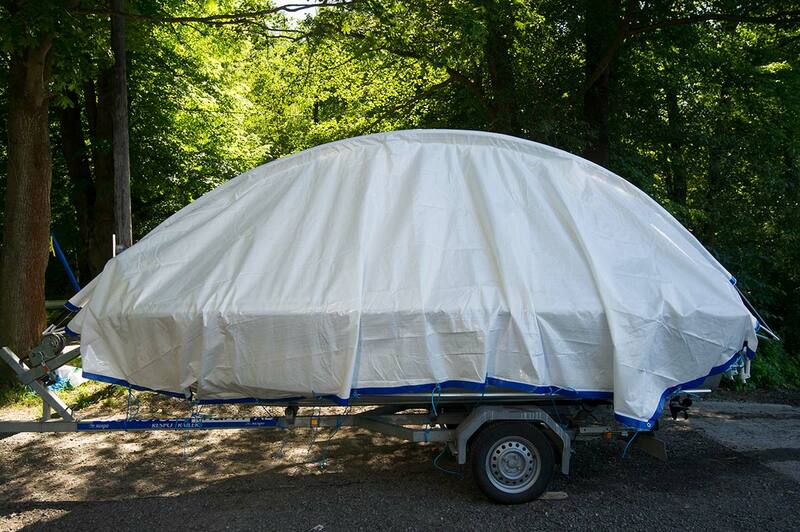 So we add 1.5 m for a 5.75 m long boat, which means 7.25 m. So package 8 is the most appropriate package. 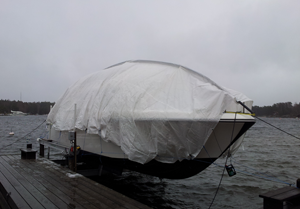 Generally speaking, you can also say that a larger superstructure means a wide boat, so you should choose a larger package with a larger tarp. 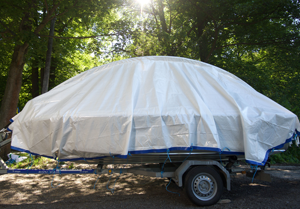 For a low, narrow boat, it might be better to choose a smaller size package. The pipe is connecting the S-hook with the short end of the S-splice. 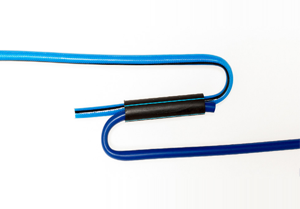 The S-hook connected with the S-splice. Do the same with the other side of the S-hook. The extended S-hook is normally used to come around a large outboard engine.